I can’t believe I live in a time where children are being taken away from their parents, to be held in separate detainment camps. I can’t believe I live in a time where a sitting U.S. President said that undocumented immigrants are not people; “they are animals.” And “Democrats are the problem. 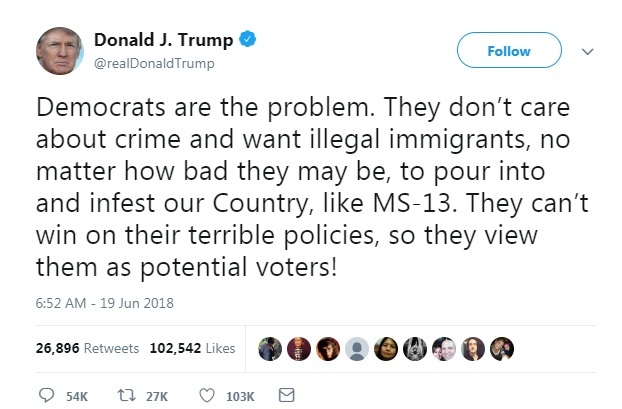 They don’t care about crime and want illegal immigrants, no matter how bad they may be, to pour into and infest our Country.” Infest? People are bugs, now? I can’t believe all this happens just a few thousand kilometers from my home, here in North America. The celebrated west. The free world. Yet, I MUST believe. For the more I might try not to believe it, as much as I don’t want to believe it, its is far more dangerous to act like this is all propaganda and lies, and that it can be ignored. Ignorance and complacency are the best friends of those who would support this reprehensible behaviour. I grew up reading about the terrible behaviour we allowed our own Canadian society to engage in and accept. You need look no further than the stories of internment of 22,000 Japanese Canadians right here in British Columbia, during war time, in the name of “national security”, are but one example. Residential schools are another national shame. These "schools" were the final resting places of thousands of indigenous children who were ripped from their families for the sake of some skewed sense of need for assimilation, ironically perpetrated on First Nations people by the very people who were, themselves, the foreigners to North American soil. Residential schools were a final resting place for many, and the beginning of a lifetime of ills for many of those who survived. We are not so far removed from these atrocities. This is only a generation ago. In the case of the Residential schools, not even a generation has actually gone by since the last doors were shuttered. We have friends and neighbours, even extended family, who know firsthand the effects of these internment camp“policies” and Residential school schemes—they are the survivors and living reminders of how unbelievably cruel we can be to one another, even here on such “civilized” soil as we have here in North America. Undocumented migrant families, many of whom are approaching the US Southern borders to legally declare themselves—people who are trying to do the right thing—are being instantly punished for their hopes and dreams of a better life. Put yourselves in the shoes of these unfortunate souls. Can you imagine, as a Canadian, approaching the US border to head into, say, Washington state, and having your children taken from you right then and there? With no understanding of why, or of where your children are being taken? My children are eight and 10 years old. The emotional punishment that children their age, half their age, and younger and older, are being forced to endure right now, here, in North America, breaks my heart. In the USA. The land of the free. Believe it. The issue of unaccompanied minors being detained is in of itself not a new issue. It first hit the news in 2014, with stories of children trying to cross the border without parents, and being detained once they hit the US border. Don't confuse that with the current, fast pace of families being split apart, being held away from each other with little to no awareness of where their family members are being sent, or why. There are ways to help. And if you’ve made it this far, and feel moved to do so, then by all means, don’t let your Canadian citizenship hold you back from trying to affect change in the U.S.
Money is one way, and there are various options. You can donate to the Immigrant Defense Project, which is concentrating on the current hotpoint issue of family separations through detentions, but they also tackle a wide spectrum of other problems facing immigrants in the US as well. More directly related to the detention issue, A legal defence fund is established to help migrants sort out their cases. You can donate, here. They have a goal of $15 million US dollars. Help them smash that goal. If you are one, or know of lawyers, law students, and paralegals with Spanish language skills, you could be of use! 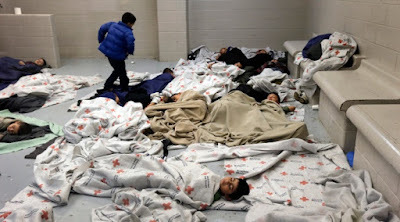 Volunteering your time for week-long assignments in Texas, to assist families held in ICE detention centers, is a tangible way to show how unimpressed you are with this current state of affairs. (Volunteer by emailing lcemails@acslaw.org). Presumably this can only apply to those who understand US law and are licensed to practice in the States, but what do I know? And, of course, educate yourself. Know what’s going on and be vocal about it. Knowledge (not propaganda!) is power. The American Civil Liberties Union have a great primer up on their page right now. In the last six weeks, 2,000 children have been separated from their parents. This is a human rights disaster. In a world full of human rights disasters, this one is happening in what should be one of the most respected, civilized societies on the planet. Believe that it is true. Take some time to think about it, talk about it, hopefully find a way to help, and try to ensure this process is reversed. Because if history is any guide, it proves that things can indeed get worse. Do we want ‘even worse’ on our conscience? Check your history text books.